Monday, 11 February 2019, 4:19p.m. We've been using an Epson EcoTank printer since July 2015. In that time, I've had to buy one bottle of black ink. One. Well, to start with, you make the ink tanks easier than ever to fill. It was with a certain nervousness I started setting up the Epson Expression ET-3700, only because when you're dealing with something as permanent as printer ink, you can count on me to get it exactly where I don't want it to go. On my previous Epson, while I never really spilled anything, I did manage to get ink on my fingers - and nobody wants that. The new EcoTanks on the ET-3700 make even my chronic clumsiness a virtual non-risk. Not only do the new ink bottles have spill-proof nozzles that allow you to connect to each tank and empty just the right amount of ink without squeezing, but each bottle can only be fitted to the corresponding tank - eliminating the risk of filling the wrong tank with the wrong colour - which would obviously be a complete disaster. 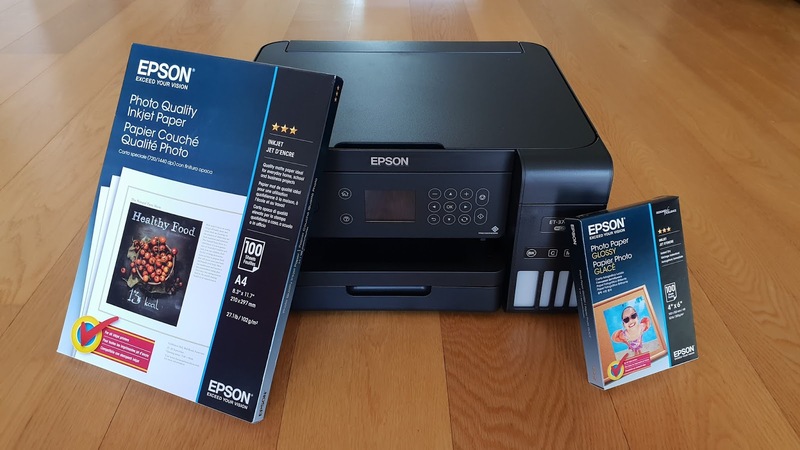 Epson claims to include "two years' worth of ink" in the box with the printer. This is pretty meaningless of course, because if you print 24 hours a day seven days a week, chances are it won't last very long at all. But if my household is anything close to typical, (don't laugh, it could be) as I've already told you, my previous Epson exceeded the the two year claim easily, so I have no reason to believe the ET-3700 will be any different. I filled all four tanks quickly and without spilling even a tiny drop. The older generation of EcoTanks were a lot more clumsy - attached to the side of the printer, you had to flip them out to fill them and the whole operation required quite a bit of extra desk space. The tanks on the ET-3700 are completely incorporated into the printer itself and much more easily accessible - just a matter of flipping open the cover on top. So filling up is easy. Then, after switching the printer on, I was surprised to find I had to wait. There's quite a drawn-out charging process which takes up to ten minutes before the ET-3700 is ready to go, first time out. This is followed by a series of calibration trial printouts during which the printer asks you questions about what it's printing to make sure the print heads are doing what they're supposed to. This happens via the 2.4" colour LCD screen of course - it doesn't actually ask you. The screen is very clear and much more user-friendly than the previous generation... so good in fact I keep forgetting it's not a touch screen. Instead it's operated by a simple set of navigation buttons on the control panel which swivels up and down to the angle you prefer. Remember, this is a printer for domestic use, so often you'll be printing to it from different devices around the house; PC's, laptops, tablets - even phones. That means connecting the ET-3700 to your WiFi needs to be straight-forward and reliable. It is. In fact, I was able to do all that from the printer itself, without having to enter the settings from another device like my desktop PC. In saying that, there is an installation disk in the box which includes any drivers you'll need if you're having trouble printing - but you won't, or at least, I didn't. I was able to print and scan straight away, my Windows 10 PC having no trouble communicating with the ET-3700 whatsoever. I could list off the various page-per-minute numbers for you, but that's why Epson has a website. Practically, what I'm happy to report is a noticeable bump in speed - not just in printing but scanning too. More often than not, by the time I got up and arrived at the printer, whatever I'd printed was already done. There's no Automatic Document Feeder (ADF) on this model, so you can't scan multiple pages at once. To be honest, that's a feature I'm more than happy to sacrifice in exchange for its small form-factor. The built-in paper cartridge (which is fairly high capacity at 150 pages) helps keep things compact too and as I've mentioned, the EcoTanks are now built-in as well so everything's very tidy indeed. What I do miss though is any kind of card reader, which means there's no option to print directly from external storage. Ah well, I can't have it all I suppose. What you can have is excellent printing and a heck of a lot of it. If I'm going to be ultra critical, I might suggest the colours err a little on the dull side - and by that, of course I mean, pictures tend to look... realistic. I can't fault how sharp and clear the print quality is - or the scan quality for that matter. But most importantly, you simply can't escape the sheer economy of Epson's EcoTank printing system. Each bottle of coloured ink retails for just $17.99, with the much larger black bottle only $34.99. Remember, I've owned an earlier model for three years and I've only ever had to buy one bottle of black ink. Compare that with my mother who uses an entry-level printer from another manufacturer. She seems to spend around $40 on a new cartridge every couple of months. The expense and hassle simply don't add up - especially when there's absolutely no compromise on quality. The ET-3700 is not the cheapest printer around, but deep down, you know those under $100 models are a con that will leave you cursing every time they demand to be fed another cartridge. If you can, I really recommend you make the long-term investment. Click here for more information and pricing on the Epson Expression ET-3700.